St. Charles for 10 Years in a Row! Celebrating our third generation in the collision repair industry and our commitment to quality and customer satisfaction. We strive to build relationships with our insurance agents and to ensure that our agents have confidence and trust in us. Fill out our form to set up an appointment for a Damage Assessment and Report, performed by one of our certified specialists! When you are in a car accident, dealing with the repair process can be intimidating. 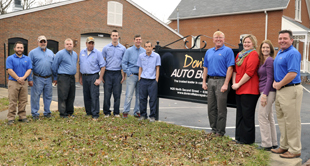 At Don's Auto Body we do everything we can to make the process as painless and easy as possible. If you are not sure what to expect, take a look at our Frequently Asked Questions. At Don's we go the extra mile to make sure your repair is done quickly and accurately. Read some testimonials from a few of our satisfied customers! I am a repeat customer of Don’s Auto Body. The staff is friendly, the parts are new, the paint job done to my car was perfect and I got my car back faster then I expected!. The paint refinish was great and you couldn’t tell my vehicle had been wrecked, it looks great! I felt like I had just dropped off the car when it was time to pick it back up!